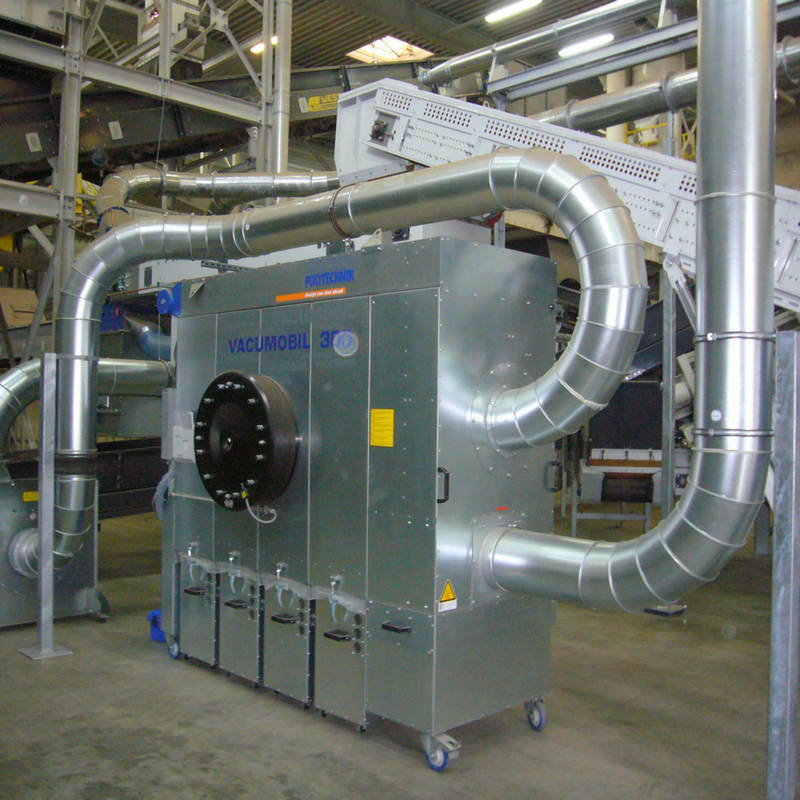 Why Choose Interior Dust Collection Units from Hocker North America? The Vacumobil 350 is the most powerful model of the popular Vacumobil series from Hocker North America. This powerful dust collector is perfect for the dedusting of CNC machine centers or several production machines. It is distinguished by many new features in terms of energy efficiency, unit size, performance characteristics, modularity and flexible range of applications. The different cleaning processes (jet and vibration) and discharge systems (collection bins, briquetting presses, rotary valves) provide customized solutions. The drive of the Vacumobil 350 is standard engineered in efficiency class IE3 and so guarantees an extremely environmentally friendly and energy-saving operation. All models of this type series are of course tested by Employers Liability Insurance Association according to GS-H0 07 and operate exclusively with duly certified filter material. In the field of process safety, the innovative dust collectors convince through an automatic re-extinguishing system and an integrated explosion-resistant swing check valve (approved for organic dust of dust explosion class St1 with a minimum ignition energy >10mJ and a lower explosive limit of at least 30 g/m3). Ideal for continuous operation (option), since jet filter cleaning with low compressed air consumption ensures effective filter regeneration and long filter life. For installation in the shop, also for explosion-prone dust-air mixtures and intermittent processes; during breaks, the system gently cleans the filters by means of vibration without the use of compressed air. The Vacumobil is delivered ready for connection with phase change plug and can, thanks to the integrated automatic re-extinguishing system, be installed in the working area without further re-protection measures. An integrated FSA-tested blowback protection secures in the area of raw air inlet the explosion decoupling and escape of dust. The rotary valves of Vacumobil JZ and VZ are pressure shock resistant and flameproof (tested Dekra-EXAM). Our mobile deduster features a special large air power for the suction of one or more dust sources. With full automatic regeneration of the filter tubes by a careful vibration for a high operating and optimum comfort. Ready for plug-in, Mobile units include PLC Control and automatic turn-on. Slide control and noise reduction is also available. The Vacumobil is a versatile, suitable, rugged and user-friendly extraction system which fully complies the current requirements. The appliance meets the requirements of the regulations TRGS 553 and DIN 8416. Residual dust amount < 0,1mg/m3 (H3). The installation in the operating room is allowed. With integrated automatic fire-extinguishing system. Connection diameter 250 or 300 mm for the suction of machines with high air requirement. No heat loss due to 100% air reduction with installation in the operating room. With specials also suitable as central suction for other machines. The optional available automatic turn-on saves the manual turn-on/off, increases the operating security and saves energy. Automatic filter dedusting with operation time addition due to vibration engine. BIA-audited filter material with less resistance and high mean life. Three movable dust collecting bins with a content of nearly 500 liters. Two kinds of control: frequency converter. Compact construction for simple installation at premises. Also available with PLC-Control in order to control automatic sliders. Available with rotary airlock or briquetting press instead of movable dust collecting bins. Control for up to 16 automatic slides possible. Thank you! Our sales team will contact you soon!